Preheat oven to 375 degrees. When copping your veggies, cut them small. It will be easier to form smooth meatballs. Heat the bacon in a nonstick skillet for 5 minutes. Set aside to cool. Combine all the ingredients (including the cooled bacon) in a bowl and mix until just combined. 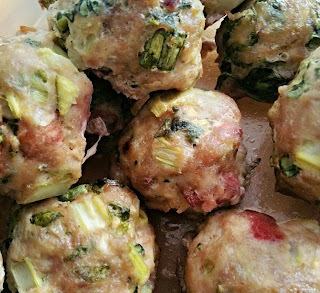 Form into 36 meatballs and place them in a baking dish. Bake for 25 minutes or until done. To prepare mustard sauce: Whisk all the ingredients together until well-combined.